One of the highlights of the Hungry Ghost Month (鬼月, Guǐ Yuè) is the Hungry Ghost Festival (中元節, Zhōng Yuán Jié). What Is the Reason for the Celebration? Buddhists and Taoists participate in rituals throughout the Hungry Ghost Month but particularly on the Hungry Ghost Festival. It is believed the gates of hell are open throughout the Hungry Ghost Month but they are most open on this night. It is believed many hungry and wayward ghosts come to visit the living. Many believers refrain from going out after the dark for fear they may encounter a ghost. They are also extra cautious near the water as the ghosts of people who die by drowning are considered especially troublesome especially when they wander the living world. How Do the Chinese Celebrated? The Hungry Ghost Festival often begins with a parade with decorated lanterns in various shapes, including boats and houses, are placed atop decorated floats. The paper lanterns are then carried to the water, lit, and released. The glowing lanterns and boats are meant to give directions to lost souls and help ghosts and deities find their way to the food offerings. The paper lanterns eventually catch on fire and sink. At some Hungry Ghost festivals, like in Keelung, Taiwan, a Chinese character of a family’s last name is placed on the lantern that the family has sponsored. It is believed the farther the lantern floats on the water, the more good fortune the family will have in the coming year. The Hungry Ghost Festival is held on the 14th day of the seventh lunar month during the month-long Ghost Month. One of the most famous Hungry Ghost Festivals is held in Badouzi, a small fishing harbor in the northeastern port city of Keelung, Taiwan. What Is the Origin of the Hungry Ghost Festival? Originally the Hungry Ghost Festival was a day to honor ancestors, but once Buddhism was introduced in China, the holiday was called Yu Lan Pen Festival, a Chinese transliteration of the Sanskrit term Ullambana. Taoists refer to the festival as Zhongyuan Jie. 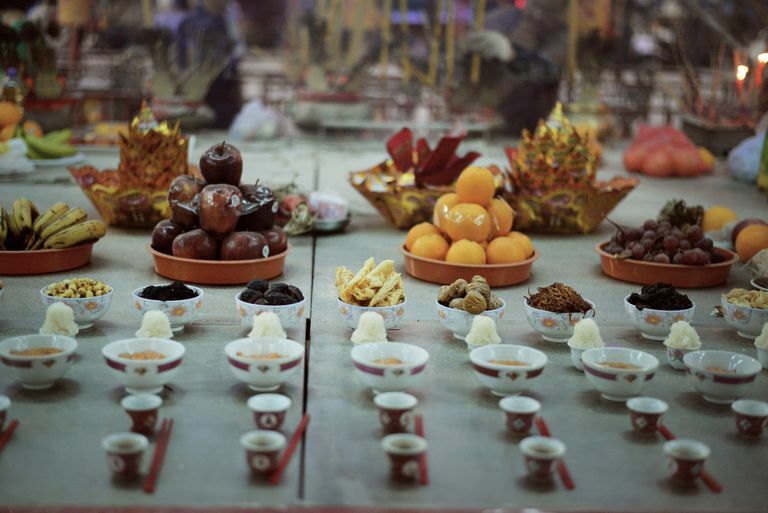 Both Buddhists and Taoists attribute the origin of the Hungry Ghost Festival to Buddhist scriptures. One story of the Hungry Ghost Festival’s origin is that of one of the Buddha’s disciples, Mulian or Maudgalyayana. He tried to save his mother from hell where she had to compete with other hungry ghosts for food. When he tried to send his mother food, it would burst into flames, so the Buddha taught him to make food offerings to the ghosts to keep them from stealing his mother’s food. Another version says Mulian traveled to hell on lunar July 15 to offer food and ask that his mother to be released. His filial piety paid off and she was released, leading to the tradition of burning incense and offering food during the Hungry Ghost Festival.